Colorado, USA-based mountain bike manufacturer Guerrilla Gravity recently launched extensive Cane Creek customization options on every model in their line-up. We shared a digital coffee with Bobby Brown, Guerrilla Gravity Marketing Manager, to learn more about the manufacturer, it’s history with Cane Creek Cycling Components, and why a Cane Creek partnership just makes sense for Guerrilla Gravity. Guerrilla Gravity was founded in 2011 by Will Montague, Matt Giaraffa, and Kristy Anderson. The Shredquarters, located in downtown Denver, Colorado, was established in 2013. Matt explains, “It took the better part of a year to finalize designs, prototype the GG/DH downhill bike, and begin setting up the factory,” and Guerrilla Gravity has been a production mountain bike company ever since. There’s no doubt that Guerrilla Gravity is ultra-intriguing for mountain bike riders, from its name to its bikes. Their most common question: Where did that name come from? Guerrilla: A community driven effort to spark change, and Gravity: The fun part of mountain biking. “We believe businesses exist to serve their communities, so we’ve made it our mission is to make mountain biking more awesome. What does that entail? Improving trail access, increasing ridership, and of course making badass mountain bikes,” they state boldly on their website. 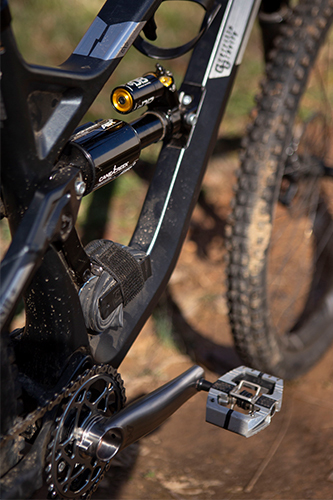 Speaking of customization… Guerrilla Gravity announced the expansion of their Cane Creek OEM partnership at their 2019 Launch Event. 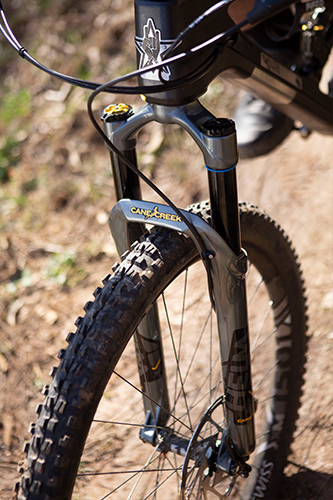 Cane Creek Helm fork will be offered as an upgrade on every model in Guerrilla Gravity’s line up. Additionally, The Smash and Megatrail will have the DBAir CS as an upgrade, and the Shred Dogg and Trail Pistol will have the DBCoil IL as an upgrade option. “A lot of riders were really excited to see the new Helm up close, and there has been a lot of interest in trying it out for the ‘19 season. Most of our riders try to go out of their way to support domestic manufacturing and everyone was stoked to see The Smash set up with some made-in-America suspension!” Marketing Manager Bobby Brown recalls. We mutually agree that Cane Creek spec option just makes sense for Guerrilla Gravity. Guerrilla Gravity is located at 2031 Bryant St, Denver, CO 80211, USA. Special thanks to Guerrilla Gravity and Bobby Brown. We’re pleased to announce that, beginning today, Cane Creek is adjusting the retail price on the HELM suspension fork from $1,100 USD to $899 USD. Our guiding principle at Cane Creek is “We believe that riding bikes makes life better – so we work to make riding bikes better.” Part of making bikes better is making our product as accessible to as many riders as possible while maintaining the standard of excellence that we’ve set for ourselves. So, in order to give as many riders as possible the opportunity to ride this amazing fork, we’ve worked to reduce its retail price. In the eighteen months since the HELM was released, the fork has received overwhelmingly positive reviews from the cycling media and riders alike – appearing on several editors’ choice lists and dream builds. The results of this success have allowed us to pay off some initial costs, such as tooling, that were required to bring the HELM to production. Also, as is the case with any hand-assembled product, we have become more efficient at producing the HELM over the last year and a half. Those efficiencies translate into cost savings. We could choose to add those cost savings to our bottom line, but we would rather pass them on to our customers and get more riders on a better fork. That’s it. There are no catches or fine print. There will be no changes to parts, design or the production process used to make the HELM as a result of this price change. This is the same outstanding fork so many riders and reviewers have raved about over the last eighteen months. We’re a small, employee-owned company made up of people who love to ride bikes, and we love the idea of more people being able to ride the HELM. So get out, go ride a bike and thanks for supporting Cane Creek. We’re happy to announce the upcoming release of both 1x and 2x crank spiders for 110 BCD chainrings. The spiders are optimized to fit Cane Creek’s eeWings cranks, adding more options for riders on the critically acclaimed titanium cranks. The spiders will allow direct-mount cranks, such as the eeWings, to accommodate 110 BCD chainrings in both 1x and 2x configurations. 2x drivetrain configurations allow for more gear options during a ride while 110 BCD 1x chainrings are typically available in larger sizes than their direct-mount counterparts – both of which are highly desirable to gravel, all-road and traditional road riders. The spiders are fully machined from 7075 series aluminum with a black anodized finish and minimal laser etching and weigh in at 50 grams for both 1x and 2x versions. They will be available for purchase in December 2018 and will retail for $49 USD. Surprise Me 2018 is here. Inspired by surfing. Loose washed lines are paired with hardline graphics in transparent colors. Its raw and subtle, yet still is without a doubt a #Speedvagen Racing Machine. #eeBrakes – REMARKABLY POWERFUL, POWERFULLY LIGHT. *You have from now until the end of the year put in your deposit for any 2018 bike with a Surprise Me paint scheme. Most people don’t know that all Cane Creek suspension is hand assembled in our factory in the mountains for North Carolina by a crew of only six Techs. The precision, quality, and performance you have ridden with for years is now available in PINK! Now until October 5th Cane Creek Cycling Components is offering a limited production run of our 110 Series and Slamset headsets in an anodized pink colorway. Thoroughly compliment the performance and beauty of the El Rosado edition eeBrakes set. Order your Pink 110 Series or Slamset headset and spacers now. Get your S.H.I.S Straight ! Use Cane Creek Fit Finder to correctly identify your headset here. The guys over at pinkbike.com have put together an awesome review of the new Cotic FlareMAX with Cane Creek HELM, DBair IL and eeWings cranks.